The cemetery served three Helena Catholic parishes from 1868 until about 1908, when Resurrection Cemetery was opened on N. Montana Avenue. Not all the remains were removed to the new cemetery, and there are still many graves beneath the grass of Robinson Park. 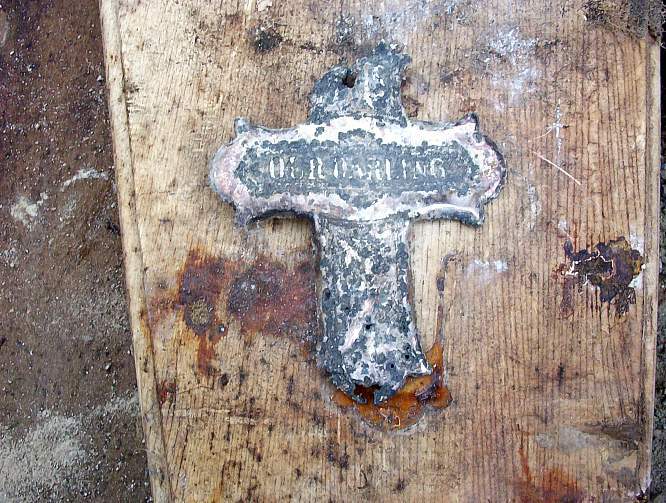 Evidently no effort was made by the Helena Diocese to remove all the remaining bodies from the cemetery, although it is believed that whatever mausoleums remained were pulled down sometime in the late 1940s or early 1950s, perhaps to prevent a repeat of this sad incident. 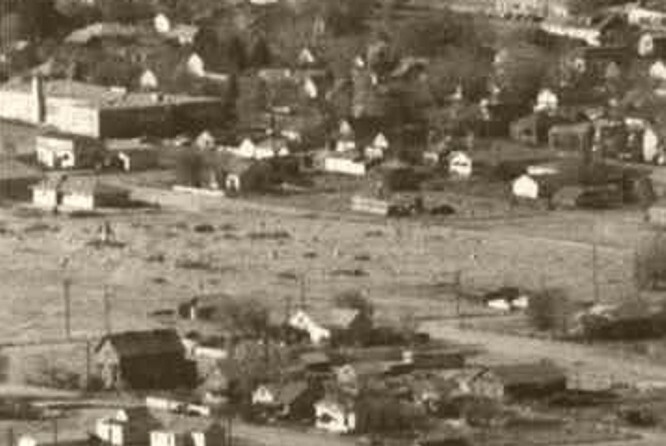 Although it is rather grainy, this enlarged detail of a 1960 aerial view of the Sixth Ward shows the state of the cemetery, with many of the tombstones apparently missing. Bryant School, on Boulder Ave., is at the upper left. 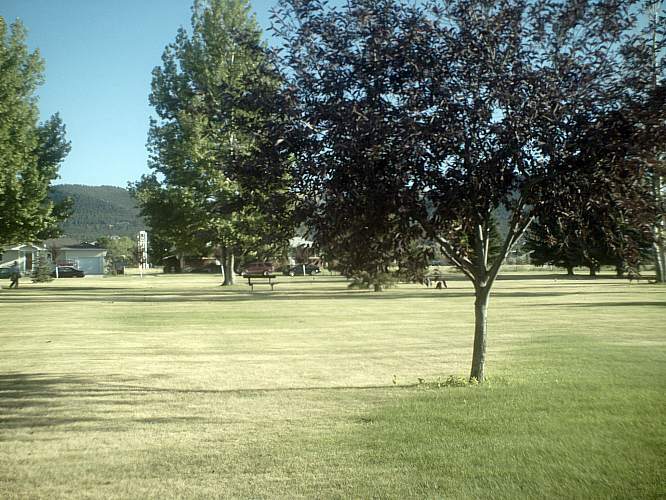 In the 1970s, it was decided to convert the cemetery into a "passive park". Headstones and other monuments were pulled up and dumped -- some in the far southeast corner of the Resurrection Cemetery property (see photos below), and some at the old Helena Sand and Gravel pit (now Spring Meadow Lake) west of Helena. Three were discovered at Benton Avenue Cemetery, where they were evidently placed by a well-meaning person. Those stones were taken to Resurrection Cemetery by Tom Pearson and son.
" 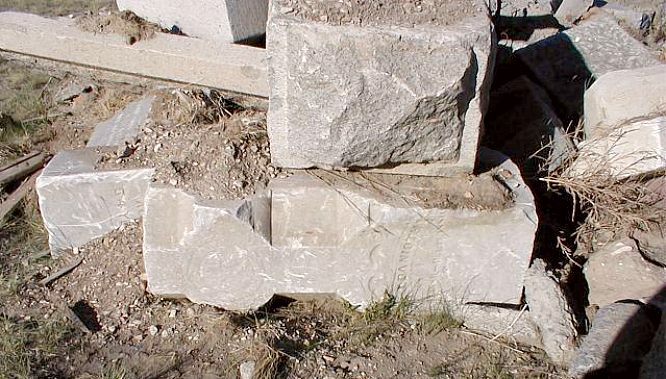 The Diocese had been allowing stone carvers and other monument companies for the last 30 years to come and collect the marble and granite from the relocation project and recycle them -- as long as they shaved the old names off. A man who lived on Hauser Blvd. in the late 80s got a truck load of stones from Resurrection and built a garden wall with them. He got complaints from his neighbors, so stucco was applied over it. Now, no one remembers or complains, but someones memories are buried In a garden wall on the west end of town." By spring of 2007, the jumble of discarded stones had been covered with tons of rock and dirt, hiding them from the view of new commercial development nearby. rest on these grounds from 1868 into the 1900s. 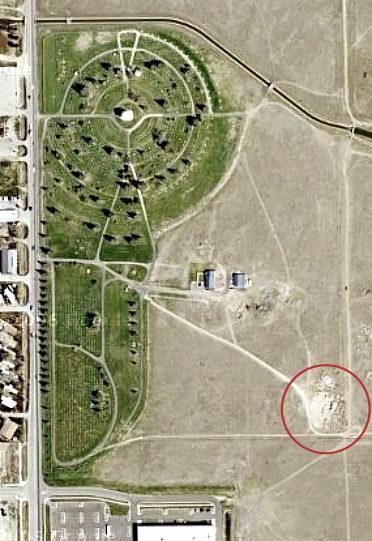 Located well out of town, thisburial ground proved more enduring than the fledgling gold camp's first"common cemetery" near the grounds of present-day Central School. 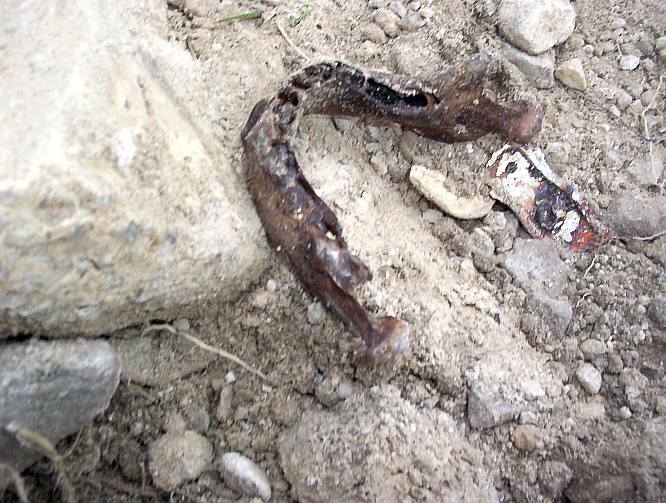 accidents and even hangings are documented causes of death. Diphtheria epidemics, cholera, typhoid, heart ailments and stillbirth claimed many children. Forty-one percent of those buried here were under the age of 15, and one family lost six infants in the space of a decade. madam Josephine "Chicago Joe" Hensley (1844-1899), Margaret Cruse, wife of mining magnate Thomas Cruse, (1861-1886) and their daughter "Mamie" (1886-1913). Many graves were later relocated, including those of the Cruse family, to the newer Resurrection Cemetery on Montana Avenue. 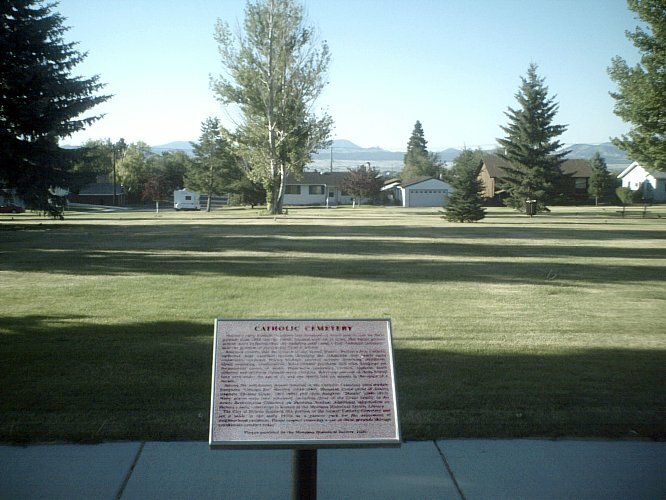 Additional information on Helena's early cemeteries is housed at the Montana Historical Society Library. enjoyment of neighborhood residents. Please respect the yesterday's use of these grounds through considerate conduct today. 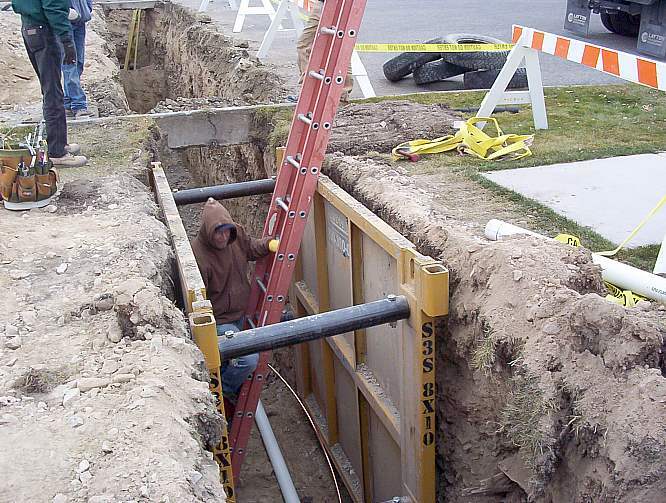 In November of 2004, a utility crew digging a trench on Townsend Avenue accidentally unearthed several graves. 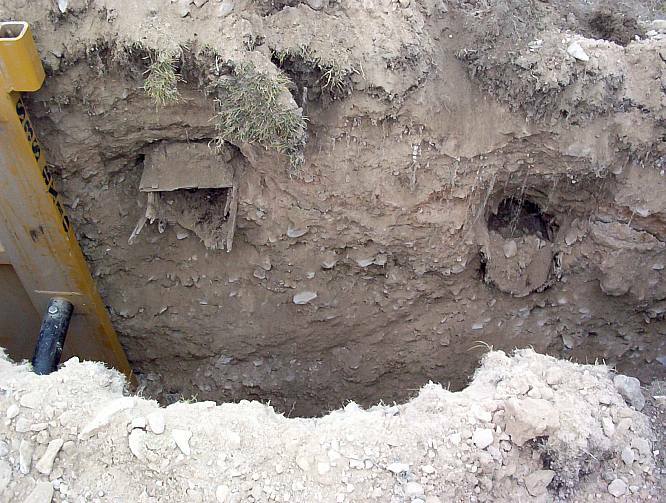 Residents of the area told the Independent Record that it was not the first time burials had been disturbed by construction. Read the story here. NOTE: The following photos, taken by Curt Milledge, are somewhat graphic. 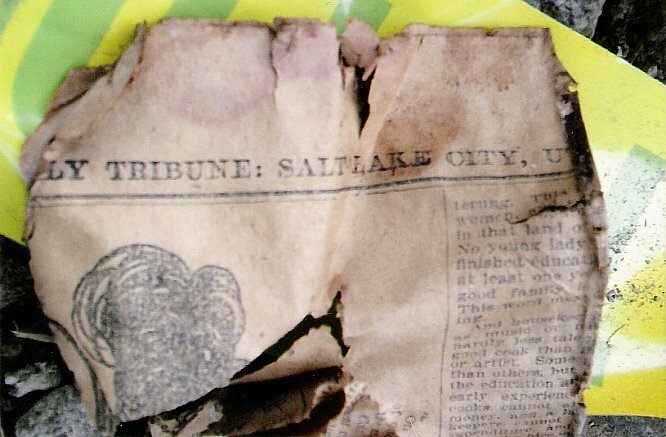 In one shattered coffin was found a copy of the November 7, 1894 Salt Lake City, Utah Daily Tribune. 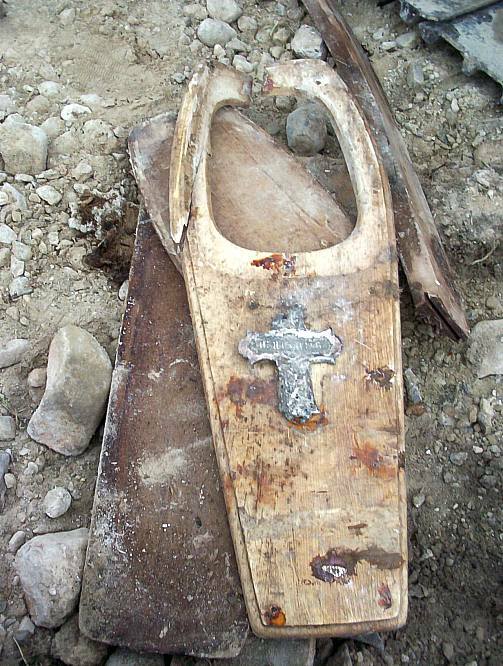 It is thought that it was placed in the coffin as a means of dating and identifying the burial. It was in remarkable condition after spending 110 years below ground. Efforts were made by local historian Charleen Spalding to obtain the paper from the individual who found it, in hopes of conserving it, but she was unsuccessful. A story has recently come to light that the skull of a man was taken from the site by a worker during the exhumations, but was later - under official pressure - reburied at Resurrection Cemetery. 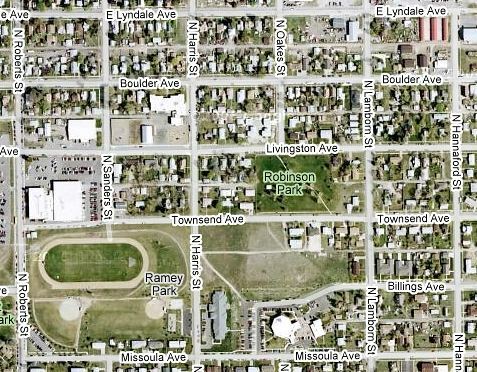 1,600 bodies remain buried under Robinson Park. If anyone has photographs of the cemetery as it once was, please contact me. THANKS TO CHARLEEN SPALDING and SISTER DOLORES BRINKEL, SCL, ARCHIVIST OF THE DIOCESE OF HELENA , FOR THEIR GREAT ASSISTANCE IN COMPILING THIS SECTION.